Based on an original screenplay by Ramin Bahrani, who will also be serving as director, the film centers on a young man (Garfield) who finds himself in deep economic debt and has his house foreclosed on him. In order to try and get his life back on track he is forced to take a job working for a real estate broker - but the twist is that his boss is the same man who took the protagonist's house. The trade notes that it will be Shannon who plays the antagonistic broker, and not only does he take Garfield's character's house, he also, "entices him into schemes to embezzle money from the government." 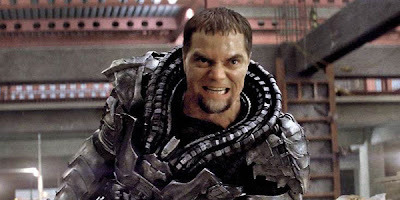 In addition to his performance in Man of Steel, Shannon also earned positive marks for his performance in the hitman thriller The Ice Man and had a small role in Jeff Nichols' Mud. He'll soon be seen in director John McNaughton's horror film The Harvest as well as David Wain's comedy They Came Together, and has completed production on Young Ones, a future-set action film starring Nicholas Hoult, Elle Fanning, and Kodi Smit-McPhee. He will soon reunite with Nichols on the sci-fi thriller Midnight Special, which will co-star Joel Edgerton and Kirsten Dunst, and can currently be seen weekly on HBO's Boardwalk Empire. There's no mention of when 99 Homes is planning to start production, but given the indie status of the film and the fact that it has enlisted its two lead actors we can probably expect production to start fairly soon. You will probably be able to find it on the festival circuit next year. Exclusive: Marvel Studios Phase Two Preview and Concept Art! 'Man of Steel 2' Logo Revealed - Zack Snyder Confirms Superman-Batman Team-up! Disclaimer: MR. EXCLUSIVE is a private, independently owned website which is intended only as entertainment. The views expressed on this website may or may not reflect those of its owner. Don't take us too seriously.